Kindergarteners are surprisingly fast learners. Our guide includes apps to help your kids learn to spell, read, and even create their own storybooks. You will also find apps for developing empathy and creativity, and learning foreign languages. Since I started this site, I’ve had many questions from other parents about the best iPad apps for their kids. It happens so frequently, I decided to compile a list of recommended iPad apps for one-year-olds, two-year-olds, and three-year-olds. Now, I am back with a new list for kids ages 4-5. Taking hints from our yearly Best Apps for Kids list, I organized this list based on each app’s use case. DragonBox Numbers teaches kids what numbers are, how they work, and what you can do with them. In the app, numbers are turned into colorful characters that can be manipulated to solve puzzles. With 350 challenges to complete, this app is an extensive resource for learning math. This app builds basic math skills through six interactive games that focus solely on subtraction. Kids have fun playing a memory game, completing a 3×3 subtraction grid, and snowboarding to solve equations. It is available in US, British, and Australian English. If you want an app that focuses on addition, check out Eggy Add to 20. A fun and comprehensive activity app based on the Montessori principles. Kids learn the concepts of addition, subtraction, odd/even numbers, and halves/doubles by playing games in three levels of learning. The app supports multiple user profiles and is available in 11 languages. Shape Arts helps kids learn about 2D shapes, spatial reasoning by solving and creating tangram puzzles. They can also share their puzzles with other Shape Artists or play puzzles made by others. A circus-themed app in which kids learn about different types of measurements: length, height, width, area, distance, and mass. They also hone counting skills as they compare, sort, and match objects. There’s also a social aspect to the app as the story teaches kids about sharing with others. BEST CURSIVE WRITING APP: Intro to Cursive also lets juniors learn about English phonics and phonograms. While cursive writing has been abandoned by some, it is still essential for a complete lesson in handwriting. This app makes learning cursive writing accessible to younger juniors. It uses D’Nealian style, which makes it easy to differentiate between the number 1, the lowercase l, and the uppercase L.
An app for practicing phonics, word building, reading, and word rhyming. It focuses on 100 words that are hard to spell such as earth, frown, sport, knight, and scratch. The words are organized into 20 levels, and kids learn each word through six mini games that involve reading and tracing. A comprehensive app that introduces kids to the alphabet, simple words, and rhymes. It covers 44 sounds in the English language in details, and includes 96 words with their corresponding pronunciations. Kids also learn to identify rhyme families, consonants, digraphs, short/long vowels, r-controlled vowels, trigraphs, and uncommon blends/digraphs. An educational and adventurous phonics based spelling game for kids grades K-2. In the app, kids follow the friendly ghost Spooka, the one-eyed mummy Sling, and the funny zombie Frank through multiple spelling levels. With rich visuals and great gameplay, the app provides hours of fun. Word Wizard lets kids build their own words and provide instant feedback by pronouncing the word as it is built. It also checks the words against a built-in spell checker and dictionary. The app supports words in Dutch, English, French, German, Spanish, and Swedish. BEST BEDTIME STORYBOOK: I Love You All The Time is about parents’ unconditional love for their children. An endearing storybook that highlights the bond between parent and child. It conveys a deep message through simple verses and rhymes. There’s also a fun feature for listening the story as a song. Best Original Storybook: Have You Heard? A funny tale about a grapevine of mix-ups, presented in colorful graphics and narrated by comedian Rhys Darby. The story is chockfull of wordplay and homophones to entertain young readers. It also includes a fun game that tests their memory and concentration. An interactive book-app with the features of an adventure game. It features an exciting plot, beautiful hand-drawn artwork, and handy features such as narration and text highlighting for developing readers. It is available in five languages: English, Polish, Russian, Spanish, and Chinese. 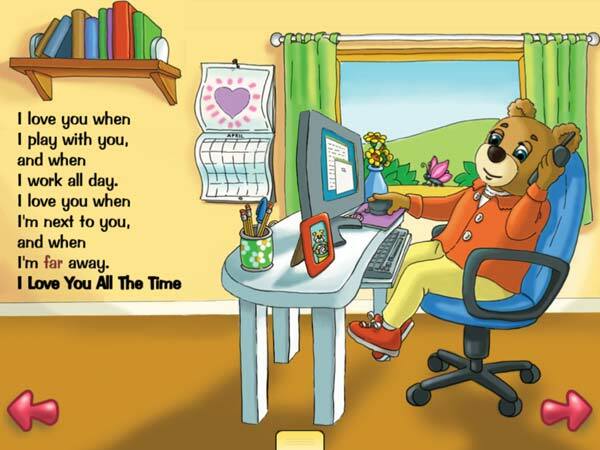 A storybook that encourages parents to read to their kids and start meaningful discussions. Throughout the story, parents can pick up tips for better storytelling. The app offers an interesting mode called Read and Talk, which foster language development in kids. Available in English and French. An interactive mini encyclopedia that covers natural facts, such as how silk is harvested. It also includes a handful of mini games to keep kids entertained. Available in English, French, German, Spanish, and Japanese. Grandma's Great Gourd combines a charming Bengali folktale, minis game, and short videos on South Asian culture. The story presents a positive message about staying level-headed in the face of danger and resourcefulness. With great production value and educational benefits, it's a great addition to any child's digital bookshelf. A silly storybook that turns fruits and veggies into anthropomorphic characters with unique personalities. Kids learn what various fruit or vegetable look like, and spin them to reveal their "bottoms". It's available as free download with optional in-app purchase, which will be donated to Fruits and Veggies More Matters initiative. A fun app in which kids learn music concept and skills. It includes five mini games that cover topics such as tempo, rhythm, notes, instruments, and music production. Kids can also record their voice to create unique sounds. An open-ended app that encourages kids to explore. It features four scenes with colorful wood blocks and animal-shaped pieces that hide interactive surprises. Fun for all ages. Toca Life: Hospital lets kids explore and create their own stories in a virtual hospital. The app has a diverse cast of characters and tons of details that allow kids to come up with all kinds of scenarios. A record feature makes it easy for kids to make their own videos and share them with family and friends. In Damki Town, kids can express their creative sides by painting funny animal characters. Each character has a name and a set of stickers that reflects his/her unique personality. Kids can save their finished artworks, send the colored pics to their friends, or share them on Facebook with their parents' permission. A handy app in which kids learn 240 everyday words. It includes plenty of mini games and a hands-on calligraphy section. Though it's aimed towards kids, adults can also take advantage of the app to learn basic Mandarin Chinese. Best App to Learn about Money: Money Up! A comprehensive and accessible app that introduces kids to coins and bills using the Next Dollar Up technique. Through seven different games, kids learn how to identify, count, and use money in a transaction. The app supports the following currencies: Australian dollar, Canadian dollar, U.S. dollar, British Pound, Euro, New Zealand dollar, Singaporean dollar. It's available in English and Spanish. In this app, kids learn about the properties of liquid and the motion of objects through 50+ puzzles with varying difficulty levels. It supports up to three user profiles. Available as a free download with one-time in-app purchase to unlock the full game. In this app, kids can create their own personalized 3D figures by coloring the 2D flattened template and folding it on screen. They can also browse through what others have created in the online community, and print out their favorite designs. This visual timer helps kids gain a sense of time. You set the timer and watch animations alongside a soothing background music. You can tap and hold to see the clock tick down, and teach your kids that a minute is equal to 60 seconds. The definitive resource for learning all about light. It covers topics from the solar system to lightsabers. Kids can watch educational videos, read articles, interact with 3D holograms, and participate in hands-on experiments. With over 100 pages of content, this app will entertain and educate for a long time. A playful way to introduce young kids to botany. This open-ended experience encourages kids to observe, experiment, and take notes to grow quirky plant characters. No reading is required to play, so everyone can join in on the fun. The ultimate app for fans of contraption puzzles. It includes 50+ puzzles to solve, multitouch support for a split-screen versus mode, and a cooperative play mode. Fun for the whole family. Thinkrolls: Kings & Queens is a physics-based platform game where you roll characters across various obstacles. It offers 200+ puzzles with increasing difficulty, characters to dress up, and fun surprises to discover. Because there is no time limit, kids can take their time to solve each puzzle and develop their logic and problem solving skills. Hoopa City 2 lets kids build the city of their dreams by combining items to create over 60 unique buildings. They can also zoom in to peek into their buildings and interact with their citizens. There's a puzzle element to the gameplay as kids try to discover various combinations, but the overall experience is lighthearted and pressure-free. If you like this guide, please follow us on Twitter or like us on Facebook for more educational app reviews.